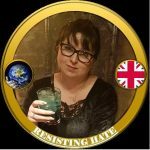 As Britain First implode under a chaos of their own making we’re going to keep this article updated with all the twists and turns and scandals as they happen. Keep checking back! Polish lady called Weronika arrives for the Britain First Rotherham protest. 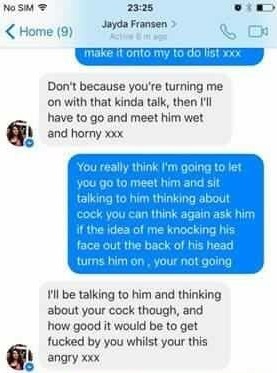 Paul fancies her. After the protest Paul Golding tries to force himself on Weronika. 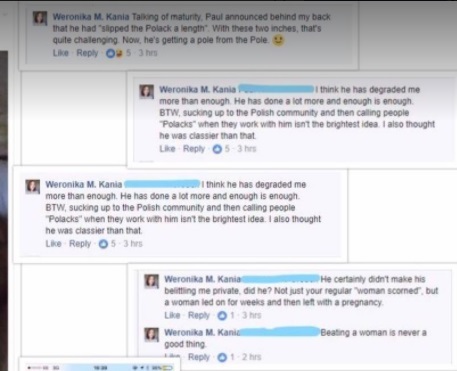 Paul Golding sleeps with Weronika and he gets her pregnant (after offering marriage and saying that she should obey him). Weronika is dumped by Golding and the split is not amicable. 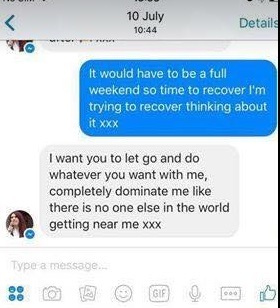 Weronika runs off to Graham Morris… who has been sleeping with Jayda. Looks like Graham has more to offer in the bedroom department. Paul’s “two inches” not really up to the mark. 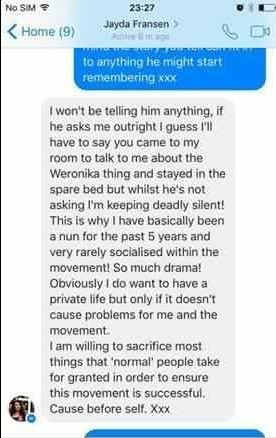 Paul Golding threatens Weronika and her family with “direct action” because of her not cooperating with him. 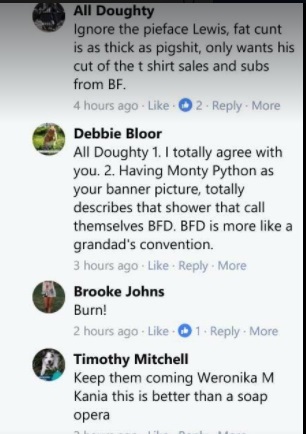 Britain First HQ call conversation in which they discuss UKIP, convicted fraudster Stephen Yaxley-Lennon’s coke habit and all sorts. 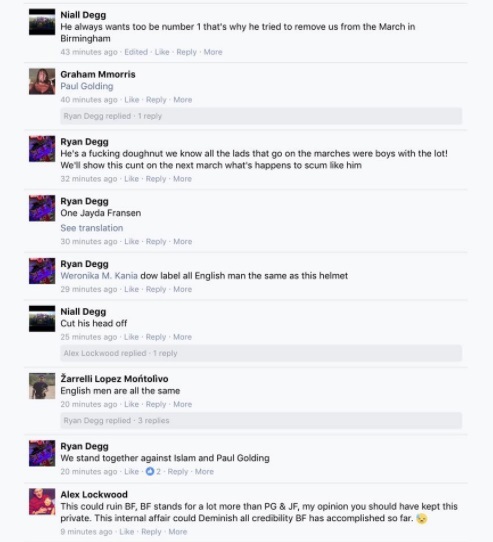 It all kicks off on FB where they are saying that Paul Golding is a scumbag (which we know). Posts were put on FB which showed the conversation with Weronika and Jayda. 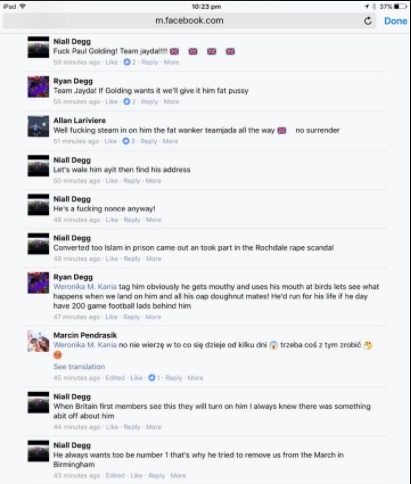 In those posts it shows that Jayda described Paul Golding as “rapey” in person and in his messages to women. 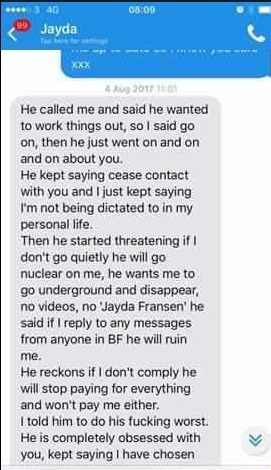 Jayda is worried about Golding’s violent nature. 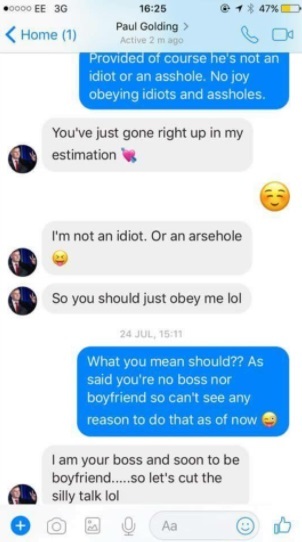 The messages also show Jayda saying that she did not trust Steve as he was the one that “grassed on her to the police”. 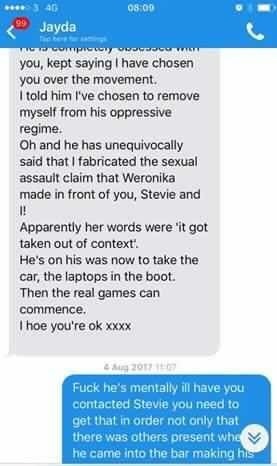 Steve Lewis (BF security) goes bonkers because he thinks that it is him being labelled as the grass. But it isn’t him, it’s Steve in the BF office. But this isn’t corrected until Steve Lewis has gone bonkers saying how Paul Golding and Jayda can’t be trusted. Jayda speaks to Graham Morris about Golding. 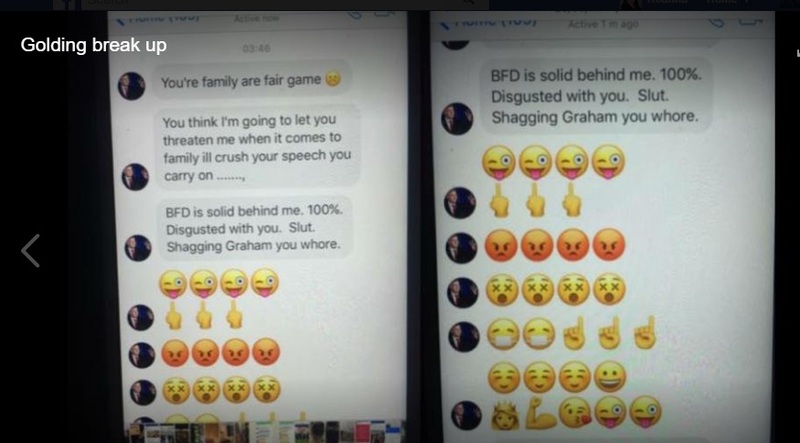 Jayda tells Graham she will lie to Golding about sleeping with him (Graham). So much infighting in BF! 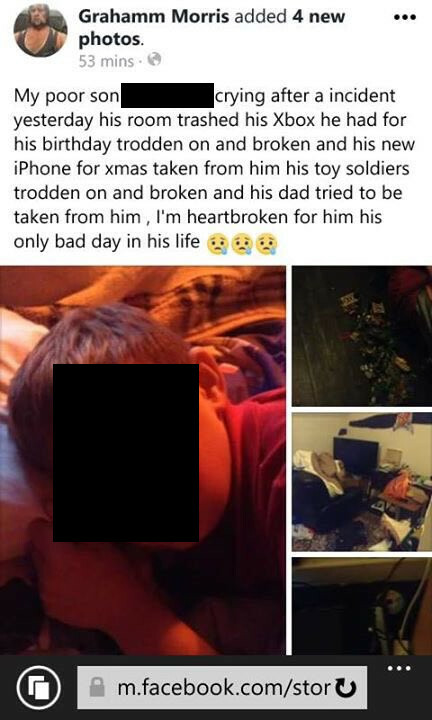 Somebody takes revenge on Graham Morris, his home is attacked, ransacked, and his 10 year old son’s toys and games are smashed. 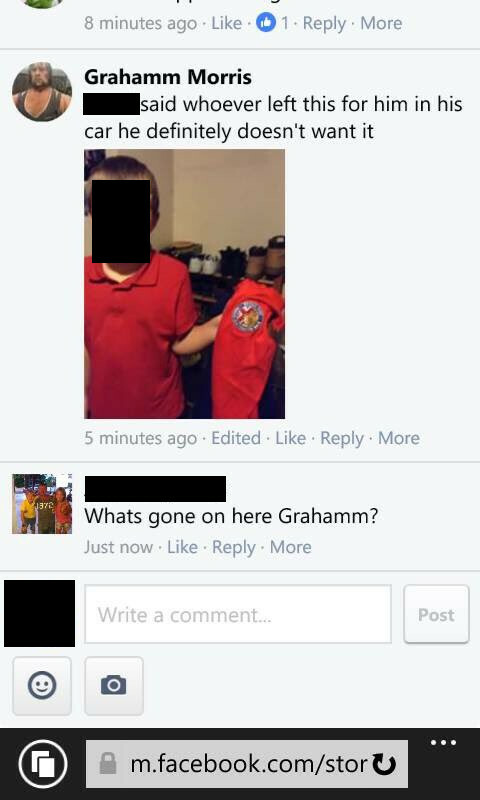 A red Britain First sweatshirt was allegedly left at the scene. Where can we see the uncensored Jayda picture? Do we have to go on the darkweb can they be found there? Halal Kitty has substantial archives of these pics but unfortunately is unable to make public for legal reasons. 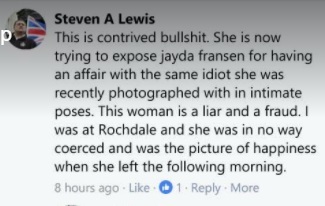 As much as we loathe Jayda and the rest of Britain First, it would be incredibly bad form to release intimate photos of her or any other member. 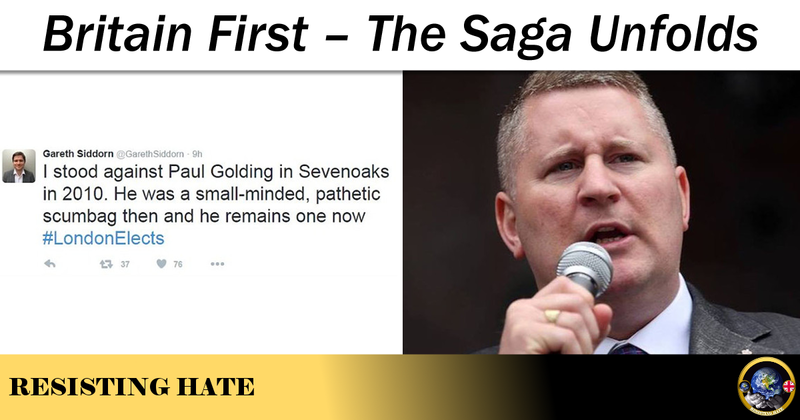 We have to combat their hatred without sinking down to their appalling levels. This is really funny and I feel absolutely no sympathy for any of the idiots involved. You lie with the dogs, you get fleas. 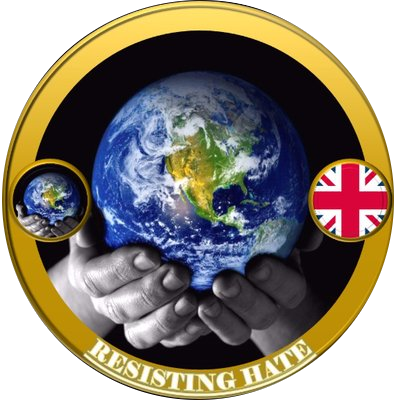 Of course, I do feel sad for the ten year old boy, but he really needs a social worker to intervene as getting involved in hate groups does affect families. 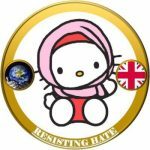 However, when you think of the peaceful areas of Birmingham, Rochdale and other multicultural areas of England this hate group has targeted, my sympathy is always first and foremost with my muslim brothers and sisters who have been intimidated, insulted, slandered and even physically attacked by this far right sect.